An apartment in a new modern complex in Alsancak is an ideal selection for you and your family. Allow yourself to have a privileged and high quality life in a comfortable 2+1 apartment. One of exclusive advantages of the complex is its location. Apartments have wonderful sea and mountain view. The most outstanding sand beaches, restaurants and bars are available nearby. It takes only 15 minutes to reach the citycenter of Kyrenia - the most popular touristic city of Northern Cyprus - and easily access its infrastructure. You have an access to high class facilities in the complex, such as fitness center, sauna, cafe, snack-bar, covered parking area, 24/7 security, CCTV cameras, excellent municipality beach (a few minutes away). All these are available to you at any time. You will fall in love with an exceptionally designed swimming pool, which is merely a "continuation" of your apartment. You will definitely enjoy staying at home! One of the exceptional advantages of this new modern complex is its location. 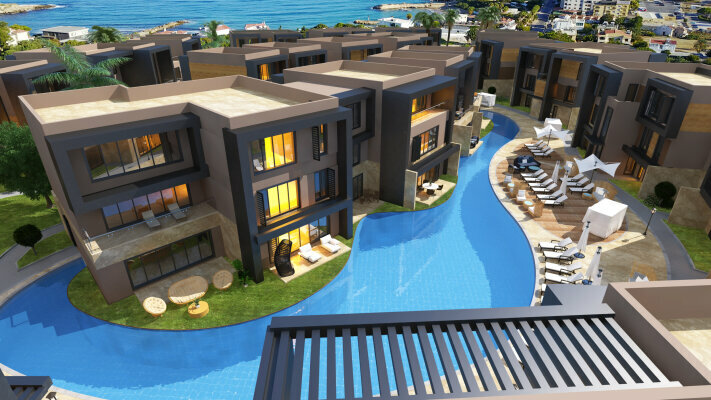 The complex is just 15 away from the citycenter of Kyrenia - the most popular touristic city of Northern Cyprus, what makes it easy to access its infrastructure. Apartments have amazing sea and mountain view. The most outstanding sand beaches, restaurants and bars are available nearby.